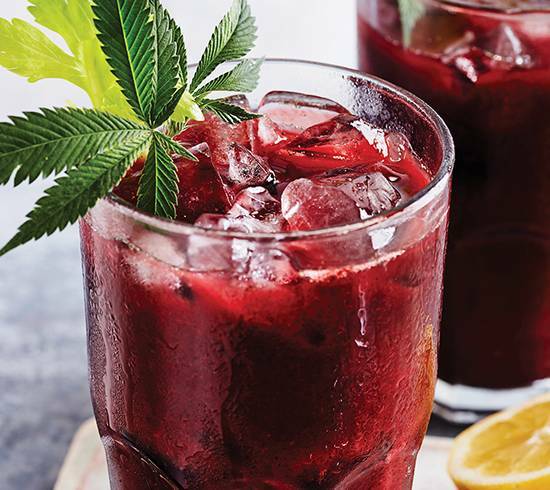 The budding trend of juicing raw cannabis leaves offers an unexpected high: another way to consume the plant’s nutrients. Though the fresh greenery isn’t intoxicating, its health-boosting compounds are becoming better known as awareness and legalization of cannabis spread. The cannabinoid tetrahydrocannabinolic acid (THCA), which occurs in high levels in raw leaves, is linked to fighting a variety of illnesses. “Let’s just start at the very basic level: cannabis is a vegetable,” says Terri Nopp, a Portland, Oregon-based cannabis expert and grower who founded Happy Parties,a series of weed events with a focus on education. Fresh cannabis leaves are not sold at dispensaries, but they can be obtained through growers. Depending on your state, you can grow your own or purchase plants (aka clones) from dispensaries. Hundreds of cannabinoids reside in the leaves. When the plant is alive, or raw, it’s rich in THCA and canabidolic acid (CBDA). When it is heated, decarboxylated, or dried, they break down into CBD and THC, the latter offering psychoactive effects as well as a different set of medicinal benefits. The CBDA found in raw leaves has anti-inflammatory and antibacterial properties and can help quell nausea and vomiting. But the health component that truly sets raw leaves apart is the THCA which has been known to treat epilepsy, protect against neurodegenerative diseases like Alzheimer’s and combat cancer by inhibiting cancer cell growth, according to Dr. Ethan Russo, director of research and development at the International Cannabis and Cannabinoids Institute. “Historically, raw cannabis was utilized in many preparations, particularly against inflammation, swelling and tumors. CBDA has been demonstrated to have a strong anti-emetic effect in animals mediated by the serotonin 5-HT1A receptor, and much more potently than CBD,” Russo has noted. “THCA has anti-inflammatory effects and may be of value in auto-immune disorders such as rheumatoid arthritis, ulcerative colitis, Crohn’s disease and multiple sclerosis. Studies suggest that it has “great potential for the treatment of obesity, metabolic syndrome, diabetes, epilepsy, dementia and cancer,” according to Russo. Just as it’s important that raw cannabis is not heated to preserve the THCA and CBDA, it’s imperative to use a masticating juicer instead of a centrifugal one. While centrifugal juicers are faster and cheaper, pulp is extracted by a spinning technique which operates at an extremely high speed that produces heat, thereby converting the THCA and CBDA compounds. A masticating juicer, on the other hand, spins at a slow RPM, preserving the freshness and rawness. It can take as long as 72 hours, and the machines cost more (between $100 and $300). But if you’re juicing cannabis specifically for its nutrients, it’s the best option. About 15 leaves will yield a shot of juice, 25 leaves will yield about 2 ounces. Unfortunately, the taste isn’t exactly pleasant. Think straight pepper mixed with kale, or even a wheatgrass shot. Nopp offers recipes here but it also can be mixed with more pleasant-tasting juices that suit your preference. Experiment with different combinations, adding the shot in small amounts and tasting along the way.